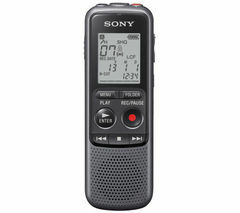 Pocket-sized and portable, dictaphones are dedicated digital voice recorders. 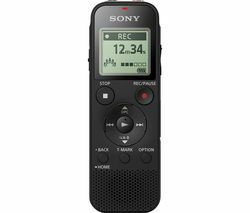 Recording to MP3, and ideal for music, meetings, interviews and dictation, they’ve long been an essential tool for journalism, business and study. Today’s dictaphones record sound digitally, to MP3 format. Clear and simple to navigate LCD screens give you ease of control, make it easy to pinpoint specific scenes and recordings, and allow for added functions like calendar access. Stop, play, rewind, fast forward, record, erase and T-mark at the touch of a button. Internal memory of up to 4GB lets you store up to 1043 hours of recordings, or opt for a Micro SD compatible model to upgrade memory even further. Digital dictaphones provide superior quality recording performance, allowing you to record in up to 320Kbps. 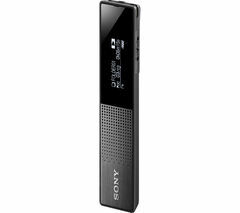 Sony models, including the Sony ICDBX140 feature Sony's Voice Activated Recording technology to ensure the dictaphone only records when there is sound, preserving memory space and disregarding pauses in conversation. At the same time, noise reduction technology helps to reduce background noise so you can capture crystal clear recordings. 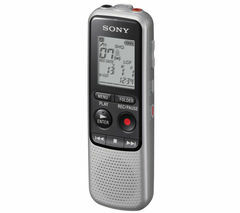 For instant MP3 recording power in your pocket, easy-to-use dictaphones are the ideal tool. Check out our other office supplies for more useful gadgets that can make work and study easier.